"The sitter for Lady on a Sofa was Gilman's sister Irene Beatrice Gilman. Her daughter Betty Powell recalls that Irene told her the circumstances of the picture being made. Irene sat frequently for her brother, often in tiring poses. This time she insisted on a more relaxed position, although lying for long periods on the sofa apparently turned out to be almost as tiring. The oblique angle of the book would make it impossible to read, and either Irene has tired of it or has actually fallen asleep. Gilman was renowned for the slow and careful pace at which he worked. Powell remembers the sofa being part of their household furniture. It was of the type that had two folding arms and, unlike the picture, her mother would usually lie on it with either one or both arms folded down. 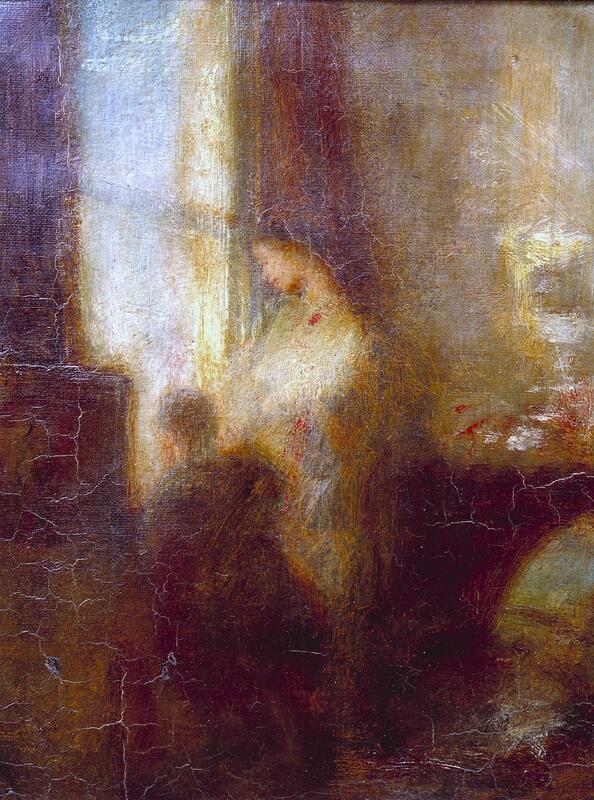 The picture was painted in Preston, probably at their parents' first house after their marriage." 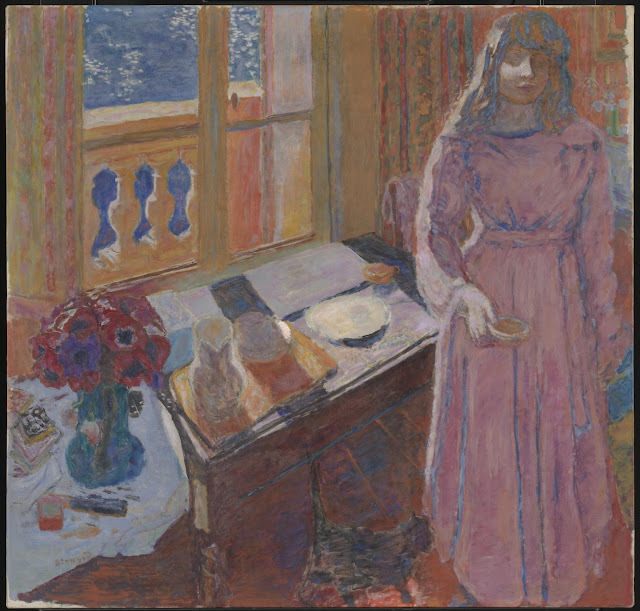 "Vuillard was associated with a group of young artists known as the Nabis, whose anti-naturalist, decorative style was influenced by Gauguin. He frequently used friends as models, but he was not a portraitist in a traditional sense. 'I don't make portraits,' he once said, 'I paint people in their homes.' 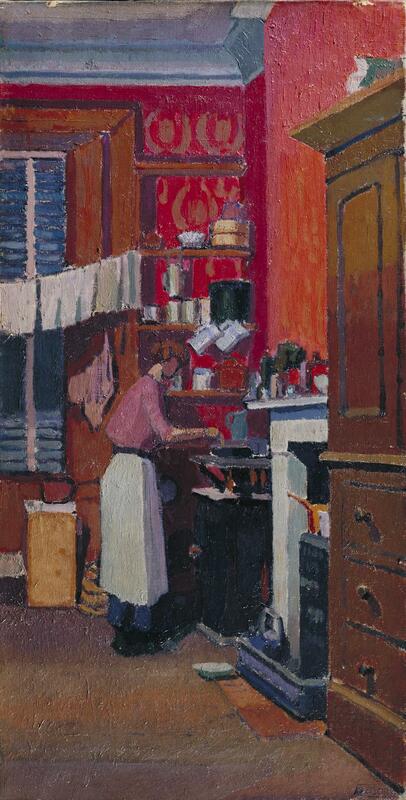 He obsessively studied the everyday objects and furnishing of middle class interiors, and represented his models as they might be seen by a friend or member of their family. The model here is Mme. 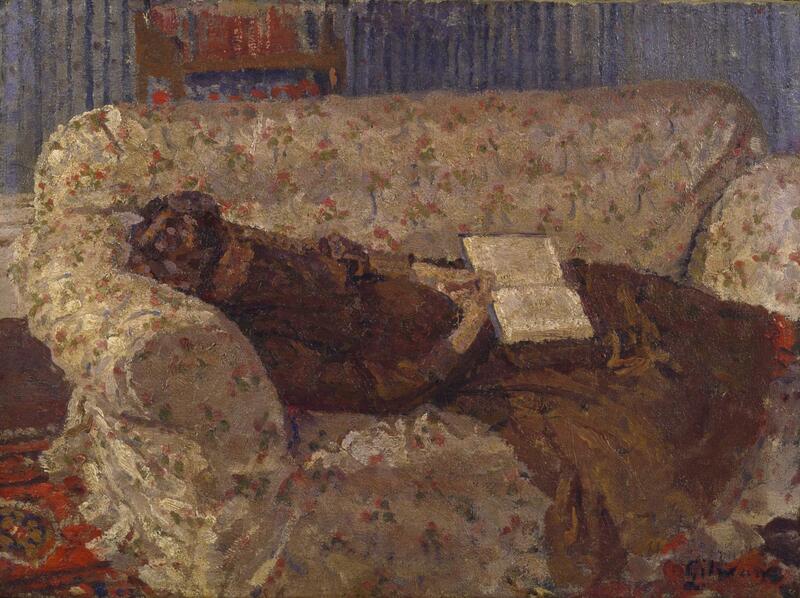 Alfred Savoir, known as Miche, an acquaintance of Vuillard's friend and dealer, Jos Hessel. She died during the Second World War." "The painting sits firmly within a tradition of still life painting that extends from seventeenth-century Dutch depictions of fruit, vegetables, game or flowers. 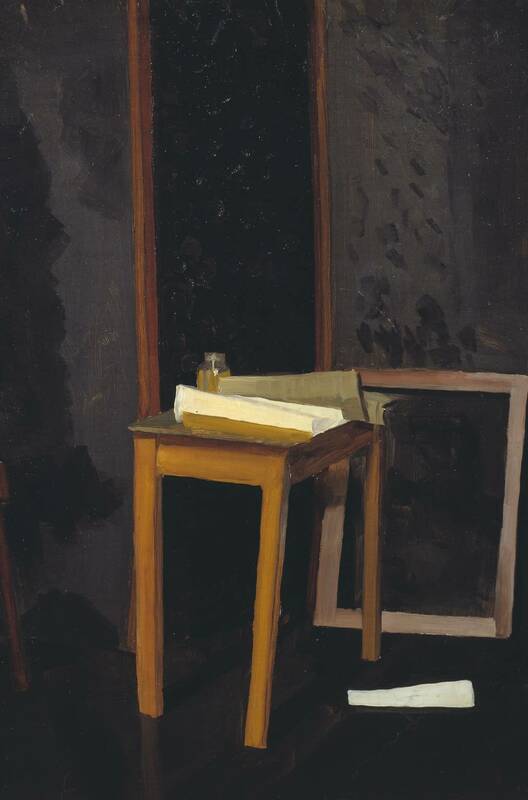 Like his Dutch predecessors, Nicholson was concerned with evoking his subject matter in a highly realistic fashion, and creating the illusion of three-dimensional objects in a two-dimensional picture. In this work, the viewer's attention is also drawn to the luscious surface qualities of the Lowestoft porcelain." 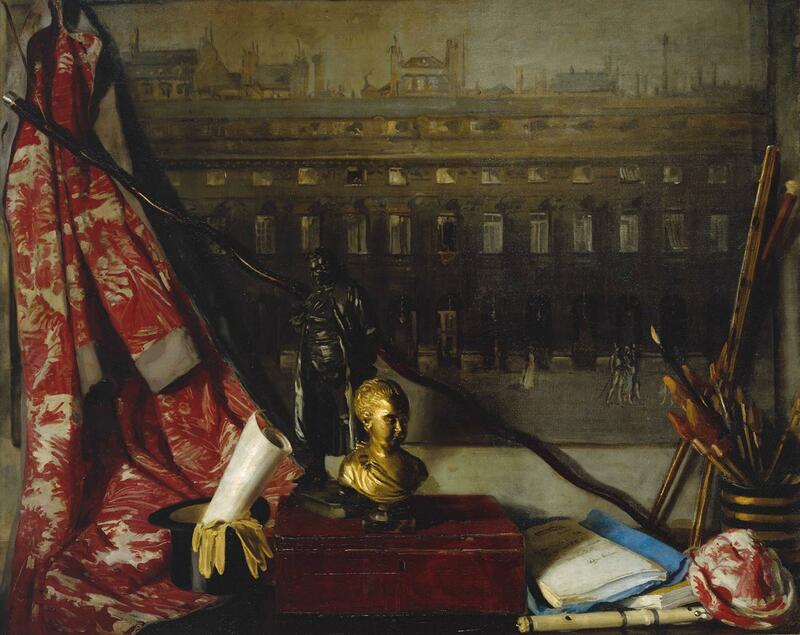 "This unusually large still life shows an unframed painting by Nicholson of the Palais Royal in Paris, with his own studio equipment arranged around it. It was a gift from the artist to the theatre producer Edward Knoblock, who had lent him his flat in the Palais Royal. At the right there is a letter from Nicholson, saying 'My dear Knoblock, Here you are, it's the best I can do. 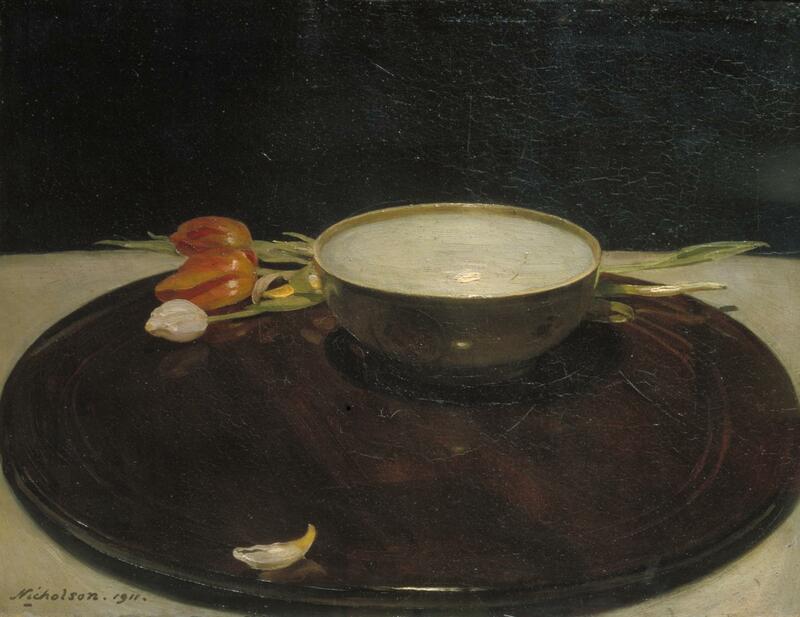 Yours affectionately, William Nicholson.' The strong eighteenth-century overtones of several of the objects, including the gilt bust and the ivory flute, suggest a conscious act of homage to Chardin." "The Café Royal in Regent Street was a meeting place for French people and artists in London. 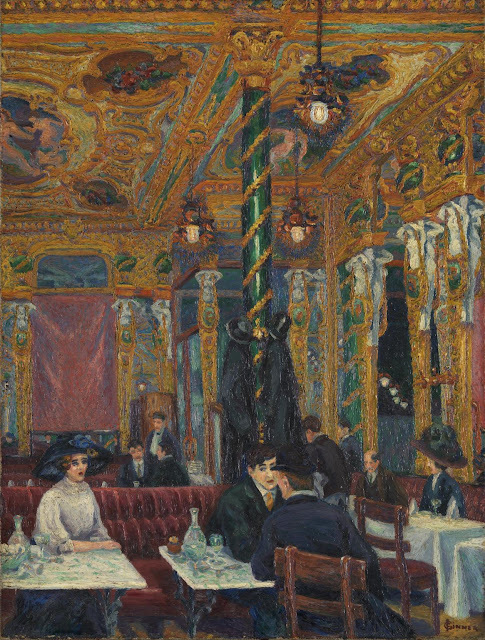 Ginner was both French-born and an artist, and could find the French newspapers at the café. 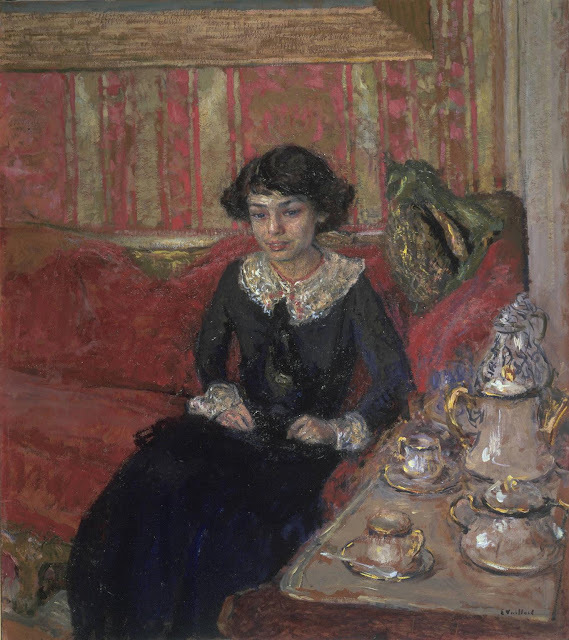 It was not an expensive place, although the drama critic Ashley Dukes remembered that his circle usually ate their dinner 'in a chop house just behind the Café' which did not have a licence for drinks, and then sat at the Café Royal for the evening with a 'mazagran, coffee and milk mixture' that cost four pence. Ginner shows a conversation between three people in the foreground. The people have not been identified, but in 1957 Marguerite Steen, the novelist and wife of William Nicholson, suggested that the man with his back to the viewer was the artist James Pryde, who did habitually wear a scarf and bowler hat in this fashion and was often in bars, though he is hardly recognisable here. The narrative in Ginner's café is comparable to the modern conversation pictures with small figures in large interiors that were pioneered by William Orpen." "It is most likely that John first visited North Wales with John Sampson, the Romany scholar, during 1901-02, when the artist was living in Liverpool. It was between 1910 and 1913 that John returned to North Wales, this time with the artist J.D. Innes, who had a great influence on him. It was Innes who liberated John's colour, which became clear and bright, and John was obviously also influenced by Innes's broad handling of paint. 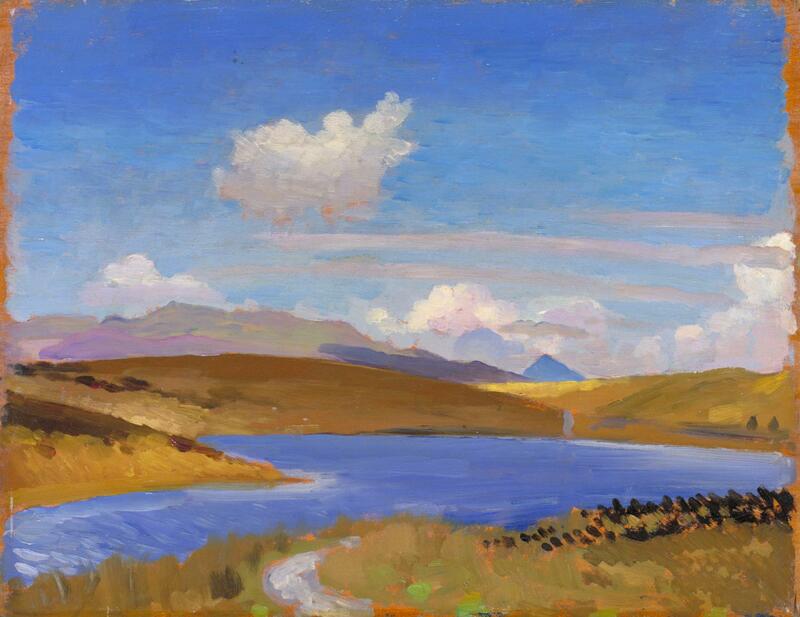 Llyn Treweryn is a little lake in North Central Merioneth, which, together with Arenig and Llyn Arenig Fawr, forms a triangle in which John painted most of his Welsh landscapes." "Following his marriage to Mollie Kerr in 1912, Spencer Gore moved into a first floor flat in Houghton Place, behind Mornington Crescent underground station. Here he shows Mollie in the kitchen of this flat, preparing dinner over the gas cooker. In common with many of his contemporaries, Gore sees an unremarkable interior and mundane domestic chores as subjects worthy of serious art, and invests them with a quiet intensity." "The identity of the classical sculpture depicted in The Uncertainty of the Poet has not been firmly established. It appears to be an Aphrodite-type cast which had its origins in the practices of nineteenth century academic art, rather than in any Greek or Roman prototype. In conversation with Richard Francis at the Tate Gallery in 1984, Roland Penrose said of this cast, 'it was well known in Paris. It was on sale in lots of shops round Montparnasse. Always that size.' 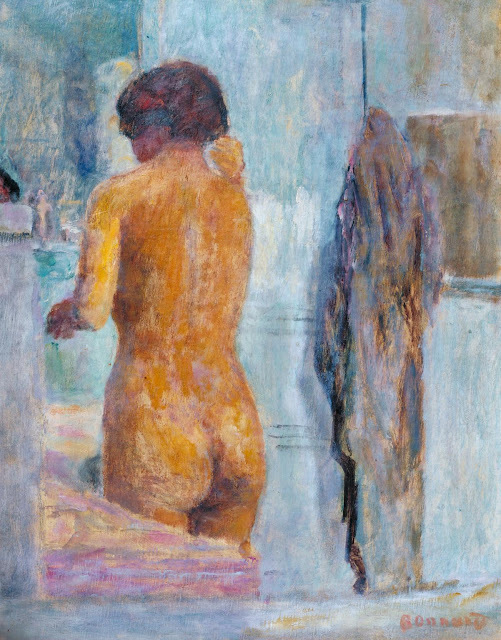 Freely available in Paris, this cast featured in works by other artists – it appears in a painting by Henri Matisse and in a collage by Max Ernst. Introduced into de Chirico's work in 1913, images of plaster casts allowed the artist to depict the human figure as part of a still-life arrangement, in scale and interest no more significant than, for example, the fruit beside it . . . the plaster casts functioned as symbols of the human presence from which the temporal and transient aspects had been stripped, and can be seen as an important element in the artist's rejection of naturalism." "Spencer liked the story in St Luke chapter 7 in which, after marvelling at the centurion's faith, Jesus heals his sick servant without entering the house. Bringing this into his own time and place, Spencer set the scene in a maid's bedroom in the attic of his home, a room which he too never entered. Sometimes he heard strange voices coming from the room, which he later discovered was simply the maid talking through the wall to another servant. Thus, the biblical narrative reminded him of experiences in his own life. These also included kneeling in prayer at church, and Cookham villagers praying around the bed of a dying man, a custom his mother had told him about. The youth on the bed has Spencer's own features." 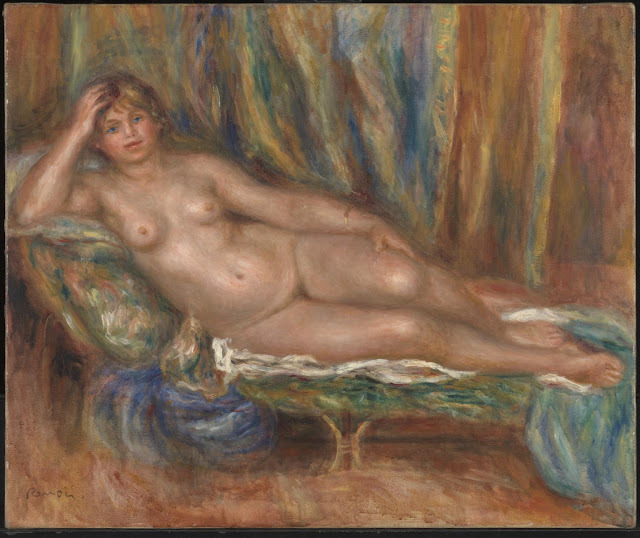 "The model for this painting was Gabrielle Renard, a cousin of Renoir's wife, who helped in the running of the household. She also was Renoir's favourite model." 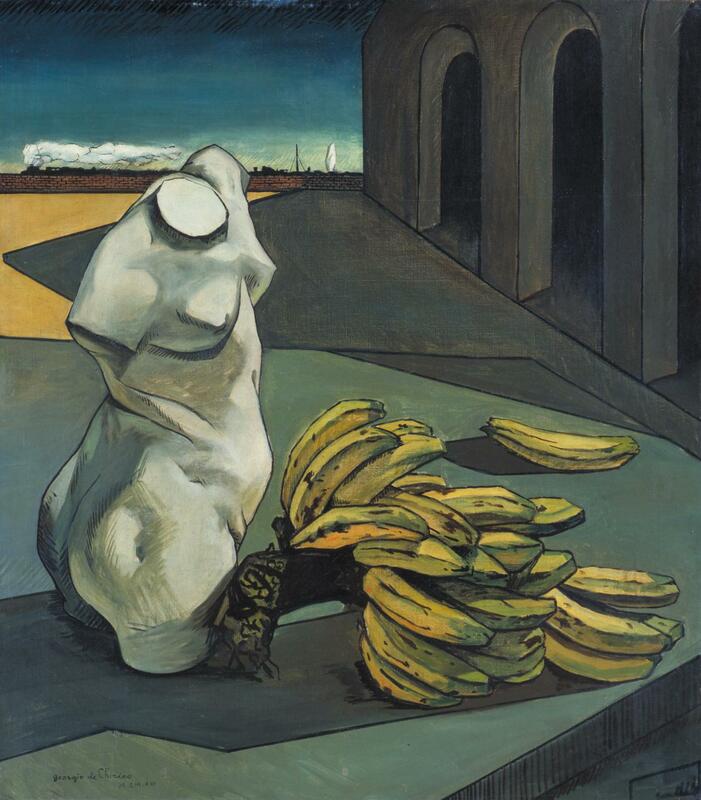 "In reply to questions about his choice of subject matter, Carline wrote, 'I suppose I can best answer this by stating that actuality, however common-place or 'banal' was part of one's philosophy, regarding art as divorced from the concept of 'the paintable' or 'the picturesque'. I wished to paint what I saw without consideration of what might prove attractive or decorative. 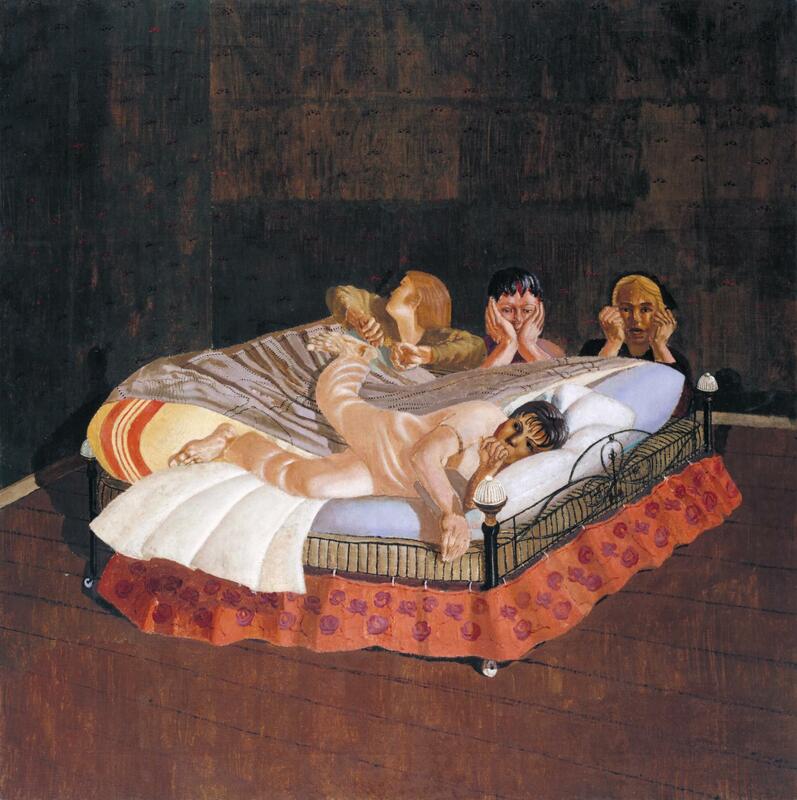 I realise that this constitutes one reason why my pictures often proved not very saleable'."